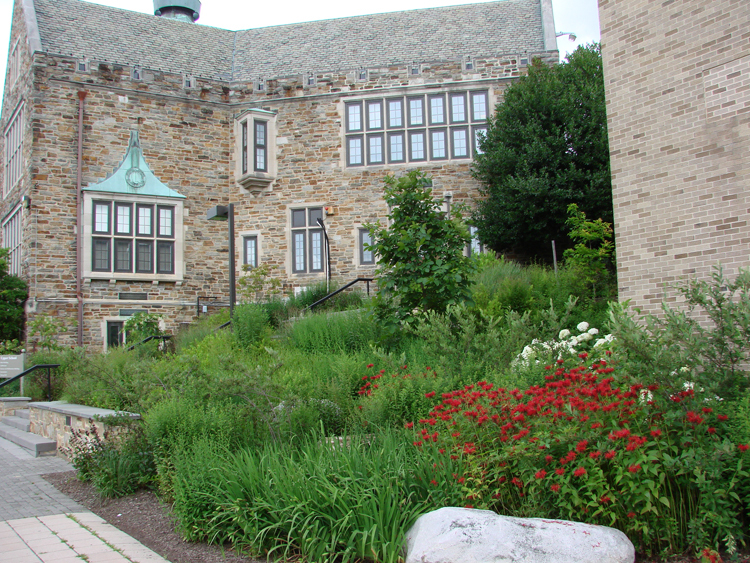 I recently had the pleasure of touring Friend School of Baltimore to view their sustainble landscape plantings. My tour guides were Kay McConnell and Ann Lundy, two members of the Guilford Garden Club (GGC) who have donated their time to help Friends become a model landscape. The partnership between Friends School (the oldest school in Baltimore, founded in 1784) and the GGC began in 2005 and has been highly successful in creating a series of Native Plant Teaching Gardens. GGC members have labored side-by-side with Friends school students, teachers and the extended community to plant over 6000 trees, shrubs, perennials, ferns and grasses in gardens designed to capture and control stormwater, provide habitat for wildlife and provide an attractive aesthetic for the school. 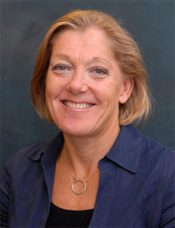 One of the first gardens was a rain garden that successfully captured water runoff preventing the adjacent parking lot from becoming a sheet of ice in the winter. In some areas, raised planters are included in landscape borders with vegetable plantings that students plant, care for, and harvest. 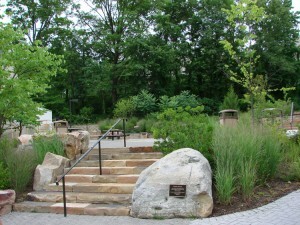 In 2011, a picnic glade was designed and installed with large boulders and a fascinating hardscape to compliment the native plantings. Each year, students add ground cover to another portion of the garden. Future plantings include beds around the base of mature trees in a large grove. I suggested prior to the bed installation, they should mark out the future beds and allow those areas to be mown infrequently (once or twice a year). It would give the sense of what the future beds will look like, reduce mowing in the meantime and protect the base of the mature trees from potential mower damage. 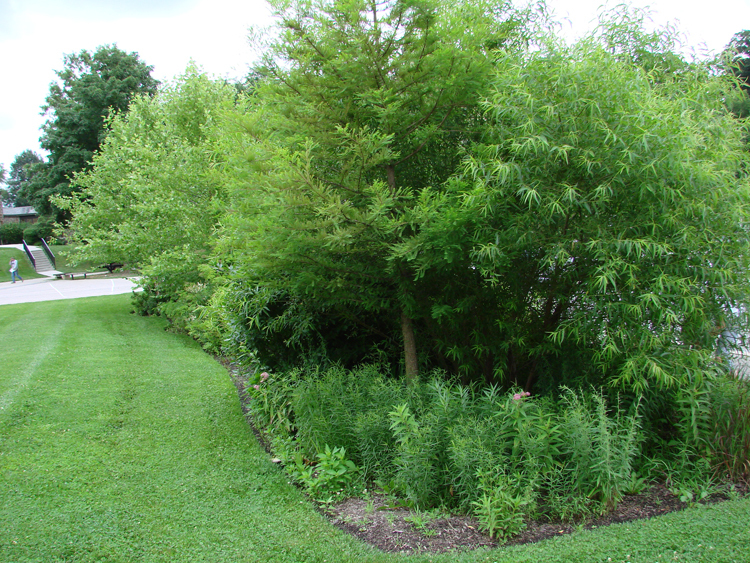 In the shade, the existing cool season grass shouldn’t grow that quickly and will just look like a taller groundcover around the base of the trees. 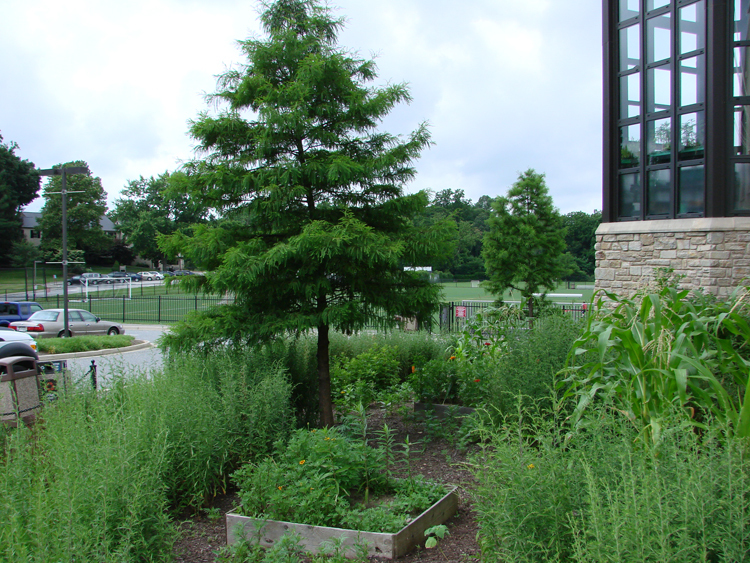 We spoke with Head of School, Matt Micciche, and he is an avowed convert to this type of landscaping. He likes the fact that the gardens look great and take less work than the previous plantings. This is just the type of model that will help convince many more people to use native plants, manage stormwater with plants, reduce areas of mowed lawn and accept a different aesthetic (but no less beautiful) for their gardens. Rain garden that protects parking lot. Vegetable planter boxes in landscpe bed. Picnic grove with native plantings. A beautiful new aesthetic for the school!